Nick Deeley 22/05/1954 - 07/06/2010. I was saddened to hear from Nick's sister Helen that Nick passed away in 2010. I was only once on an expedition with Nick (Rhum 1976) but I have fond memories of him and his amusing tales and good humour. He was a stalwart of the S.H.S and reading through the old S.H.S reports he very quickly became involved in the organisation. His first trip appears to have been in 1972 to South Uist (16-17 years age group) where he obviously enjoyed himself as he returned the following year to South Uist. This was a special expedition the main purpose of which was to bring some archaeological work at Usinish Bay to a point where the site could be left after the completion of a satisfactory cycle of digging. By the 1974 expedition season he was Camp Administrator on the Raasay trip. He lead his first expedition in 1975 to Mingulay - in fact two expeditions, there was Mingulay I and II. He was also an 'Executive Officer' in the same year. 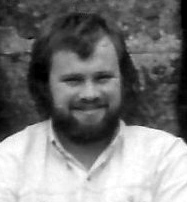 1976 Nick was now a Director of the Society, he put his Camp Administrator hat back on for the Rhum expedition where I first met him (I'd quite likely met him before this at the various conferences but either wasn't aware that I had or have since forgotten!). As I haven't read all the reports yet I don't know whether Nick was a participant in other expeditions but he was leader on two further expeditions, again to Mingulay in 1980 and 1984. I think I have mentioned earlier, I'm not sure (-well I am fairly sure actually) that the amount of work put in by Nick and all the other Officers and Directors of the Society was not properly appreciated by most of the 'boys' on the trips. Now, reading the reports and seeing how much organisation went into each and every one of those 'Holidays' (for us at least), I feel, although sadly too late for Nick, I owe a great debt of gratitude to him and all the others who made these Expeditions possible. In his Will Nick requested that his ashes should be scattered on Mingulay - his wishes were carried out by his family so Nick finally returned to what I'm sure was his favourite isle of the Hebrides. I will be leading an Expedition to a remote and uninhabited island off the west coast of Scotland in August. It is with some sadness and concern that we have come to realise that there will be no chance to purchase your fine and restorative beverage whilst on the island. Dear Mr Deeley, thank you for your recent letter. We are delighted to be able to help with your dilemma so please find enclosed 2 dozen cans of Guinness. Apparently the Guinness was delivered separately but I remember Nick being tickled by the concept of enclosing that much Guinness in an envelope. In return for the Guinness it was requested that they take a few photos of the drinks being consumed - around a camp fire or something 'outdoorsy' - for their 'in-house' magazine. They went one stage further and apparently placed some cans outside Puffin burrows, managing to get a few shots of a puffin stood next to a can or even with a wing resting on a can. I have no idea if it was true, I certainly believed it at the time and would love to believe it even now. So if you know - let me know! 20/05/2017. Message from Craig Roscoe in an e-mail to me. "On another point, the ‘crates of Guinness’ legend on Nick Deeley’s Mingulay one is entirely factual. All we had to do was supply some photographs for their staff mag in return for their welcome product."